Set with two rows of delicately dazzling diamonds, this chic 9ct white gold eternity style ring is crafted in an elegant shape. Designed to sparkle at every opportunity, this captivating piece is perfect as a wedding ring to beautifully commemorate your special day. Elegant jewellery for that special occasion. 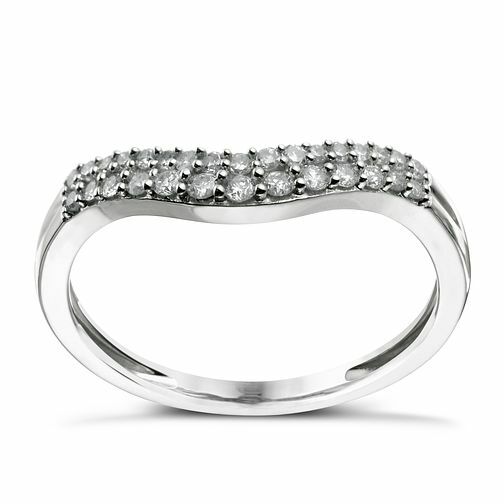 9ct white gold 20 point diamond shaped ring is rated 5.0 out of 5 by 1. Rated 5 out of 5 by Anonymous from Elegant and classy! Extremely beautiful and classy ring! The 2 rows of diamonds give an amazing shine! Also the Marlowes Shopping Centre staff ( Hemel Hempstead) are very experienced, can't thank them enough for all their support and professionalism.